At least six people are feared dead in a bloody fight between two rival cults late Sunday and on Monday morning in Ijebu-Igbo, Ogun state. 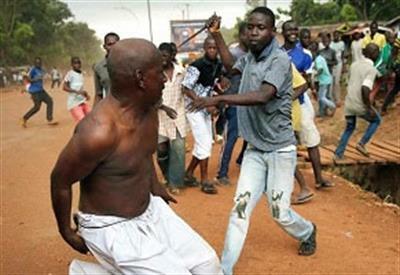 No fewer than six people were feared dead after two cult groups got into a bloody fight in Ijebu-Igbo, Ogun State. Among the victims are a bricklayer and a family of three, who were caught up in a crossfire. The four persons were allegedly shot dead during the clash. The fight, started around 5:30pm on Sunday at Oke Sopen Road before it spilled over to Oke Agbo and Ojowo areas with gunshots fired intermittently. Two additional victims got killed in a pre-dawn reprisal on Monday. The incident was also confirmed by the Public Relations Officer of the Ogun State Police Command, DSP Abimbola Oyeyemi.